Trolling the depths of the net in search of the right budget tablet for you can be a a serious time sink – we’re here to help. 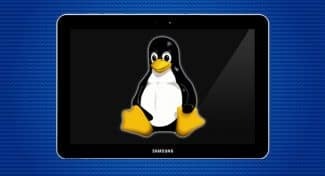 This guide covers the best cheap tablets under $100 based on professional reviews, sales, build quality and consumer feedback. 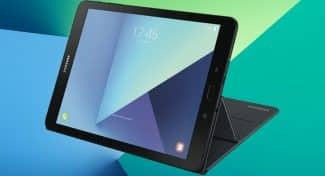 Even though this is a range for budget tablets, there are still many deals from leading manufacturers as well as some sneaky alternatives from some lesser known brands at bargain prices. Be warned though: For the best tablet experience possible we suggest you checkout out our list of cheap tablets under $200 or our guide to the best cheap tablets under $300, as the sub-$100 can be prone to cutting corners and may not always provide the best experience possible. Our best tablets under 7-inches guide also offers some great 7-inch budget tablets. If you are looking for a cheap educational tablet for your child also be sure to check out our guide to the best tablets for kids. As always, the key to finding the ultimate cheap tablet to meet your needs is to put in the time to research all of your options before pulling the trigger – our cheap tablet guides are a great place to start. With the tablet market still falling far short of the Smartphone arena, you may also want to consider reviewing our partner guide to the best unlocked cheap smartphones over at SmartphoneNinja – you may find a new smartphone more appealing than forking out for a tablet. If you are new to tablets I suggest checking out our Tablet Buying Guide which will give you a great rundown of the basics you’ll need in order to understand what makes a tablet tick. If you’re already experienced in the tablet game or would rather let the pros do most of the research for you then feel free to carry on reading below. 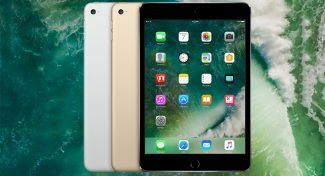 There aren’t too many tablets on this list quite simply because there are not that many tablets within this price range we would recommend. These tablets are our top picks of the moment and many of them are marked down at discount prices ripe for the picking. Generally specials can last from a couple weeks to a couple of months (sometimes on old stock) so be sure to take full advantage if you can. 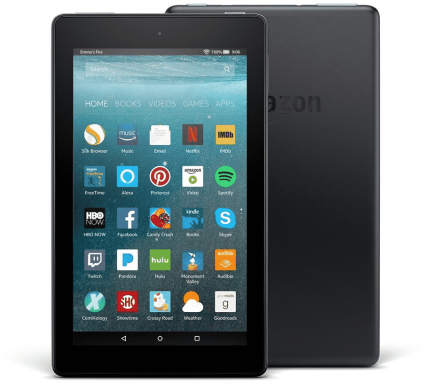 Amazon’s 2017 edition of the Fire HD 8 has earned itself a top spot in the bestsellers list on Amazon due to its great value and overall performance. This budget tablet features an 8-inch, 1280 x 800 LCD IPS screen, which many users found to be more than sufficient. However, the folks over at Trusted Reviews have found that the screen reflects quite a bit of ambient light, which could be a little annoying and inconvenient at times. Little complaints were directed towards its performance, with users finding that the 1.3Ghz quad-processor ensures a rather responsive tablet. The battery life is around 12 hours for most and it features Amazon’s super helpful and super intuitive AI, Alexa. FireOS is based on Android, but some found that it does take some time to get used to it. The Amazon Appstore is packed with apps, however, some of the best Android apps, such as the Google suite of apps, are absent, which may be disappointing for some. The Fire HD 8 also comes with useful parental control abilities and a rather impressive battery life of around 12-hours. The two stereo speakers have been commended by many, finding that they are loud and clear enough when used for both movies and music. The RAM is still the same as the previous version at 1.5GB, and as mentioned above, it allows for reasonable performance and makes multitasking fairly easy. The Fire HD 8 remains a popular budget tablet amongst Amazon customers, and thanks to its great price and decent performance, it will surely remain one of the top 2017 budget tablets. The 2017 Amazon Fire HD 8 is one of the best budget tablets currently available, offering a pleasing overall performance with a great battery life, but its cameras are average at best, and the Fire OS may not be for everyone. Amazon’s 2017 Fire 7 Kids Edition tablet is well suited to kids and for the price, it’s a steal. The 7-inch IPS screen is plenty for its target market, and built kid-proof with its foam shell that surrounds the tablet. While the resolution of 1024 x 600 is fairly low, it shouldn’t distract kids. The interface is designed for kids, who will easily be able to navigate around the tablets various features and apps. Furthermore, it comes with a one year access to FreeTime Unlimited, which gives kids access to 13,000 books, movies, TV shows, educational apps, and games. The tablet also allows for parental controls to be setup, allowing you to monitor and restrict your child’s activities. This is done through a multiple profile setup, allowing you to create separate profiles for you and your kids. With its 1.3GHz processor and 1GB of RAM, the performance is ideal for kids. The battery life is said to be around 8 hours and it comes with a two year guarantee, so if it breaks, you can easily get it replaced. The camera quality is rather poor however, with a 2MP back camera and a VGA front camera. The speaker quality is also not the best, but a pair of headphones can always be plugged in to improve on the listening experience. With younger kids sometimes downloading anything and everything they see, the 16GB as well as the 32GB is fairly limited, and it may be necessary to get an additional SD card. 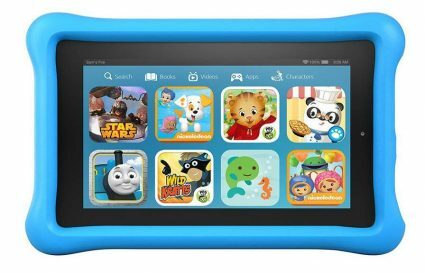 Amazon’s 2017 Fire 7 Kids Edition tablet offers parents good control of their children’s activities and it allows kids to access good content with FreeTime Unlimited. The 2017 edition of the Fire 7 still pushes for top spot in the low-end tablet market. Minor changes have been implemented to improve the user experience of this already incredibly cheap tablet. While the resolution of 1024 x 600 is pretty low, the 7-inch screen has been improved in terms of clarity and contrast thanks to what Amazon says is an improved IPS panel. Alexa, Amazon’s AI, has also been integrated and remains a super useful and helpful assistant. Those with fairly modest expectations were rather impressed with the performance of the Fire 7. Packing a 1.3GHz quad-core processor, it handles most applications reasonably well, but you can definitely expect some slowdowns with certain resource heavy applications, especially since it only has 1GB of RAM. The camera quality is one of the biggest let downs for users, with the rear camera only being 2MP, and the front a VGA camera. Fire OS is reasonably easy to navigate, but the lack of the Chrome browser and the Google Play Store could turn away potential buyers. To make full use of the all the Amazon services offered by this Amazon orientated tablet, you will need to get an Amazon Prime membership. The battery life is said to be around 7 hours in the Amazon product description, but this is surely for light users, as those who use the tablet heavily suggest that they only get around 4 hours. On top of this, the 5V 1a charger charges incredibly slowly, taking around 6 hours to fully charge according to the folks over at Trusted Review. Amazon’s Fire 7 is marketed towards those on a lower budget, delivering a decent performance for the incredibly low price. The battery life and slow charging can be frustrating, however, and the fact that it is heavily Amazon services orientated. The Amazon Fire 7 suffers from a few drawbacks, such as a rather low resolution screen and the slow charging, but it puts up a decent performance for a tablet in this price range, remaining a popular budget tablet. While Samsung has always been a dominant force in the tablet industry, it has not been particularly famous for its budget-friendly devices. This year’s Tab E is therefore a rare addition to the Galaxy line of products. 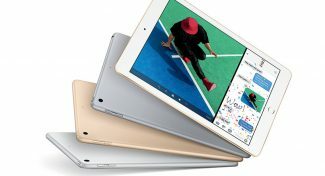 As expected, the tablet suffers more than a few tolerable compromises, which include a somewhat boring design, a modest 1024×600-pixel resolution 7-inch display, and inadequate sound output from the weak speaker situated at the back of the device. The software however, is one of the areas the Tab E Lite excels the most. Based on Android 4.4 KitKat, Samsung has been gentle enough to leave the user interface largely unpopulated by intrusive bloatware, while offering up a decent array of useful perks. Among these is a very intuitive Kid’s mode, which is especially designed with kids in mind, and has adequate parental control features that will effectively integrate you to your child’s learning journey. 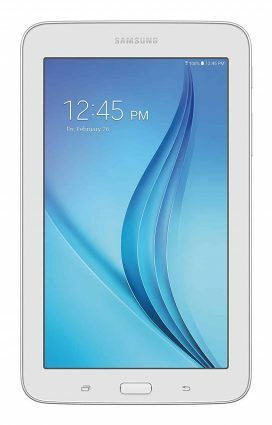 Powered by a 1.3GHz quad-core processor and 1GB of RAM, the Galaxy Tab E Lite handles basic tasks and light gaming reasonably well. 8GB internal storage is not much by any standard, but you do get a microSD slot for further memory expansion. Both the 2MP rear camera and the VGA front sensor fit well within the tablet’s price constraints. The 3600 Li-Ion cell is however more commendable, as you get up to a decent 8 hours of video play time and a little over 9 hours of continuous internet browsing. For some, the Samsung Galaxy Tab E Lite 7 might not come off as a good bargain; but if you have long admired and appreciated Samsung devices and the quality they come with, this one will not let you down. If you’re a Windows fan, and you are on a tight budget, the 2017 Nuvision 8-inch budget tablet should not be overlooked. It boasts a Full-HD display that is said to be sharp and clear, and runs most basic tasks with relative ease. The Intel Atom x5-Z8300 Quad-Core Processor does take a hit when resource heavy apps are running, however. The 2GB of RAM is decent for multitasking and most thought that the tablet feels good in hand with its lightweight build, weighing in at 9.6-ounces. It has a dedicated Windows capacitive key on the front of the device, and two built-in speakers at the bottom. There were some reports that its Wi-Fi is terribly slow, making web page load times slightly slow and updates a headache. Furthermore, the battery life has received quite a bit of criticism. It states that it has around 6 hours of battery on a single charge, but some reports suggest around 4 hours at most. 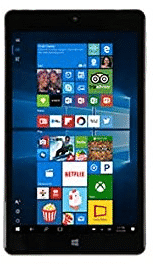 It has 32GB of internal storage, but it may be recommended to upgrade that to 64GB via a microSD card, as Windows 10 does take up quite a bit of space, leaving you with only 10-14GB of free space for you to work with, and apps and files will fill up that space really quickly. Its screen is said be responsive and easy to use. Some found that it froze randomly, however, requiring a reboot. This does prove to be rather frustrating, but for the price, most were still impressed with its capabilities. 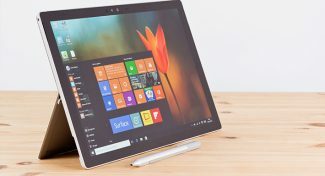 The 2017 NuVision budget Windows 10 tablet is well priced and does the basics well, but its battery life and reportedly slow WiFi may be deal breakers for some. 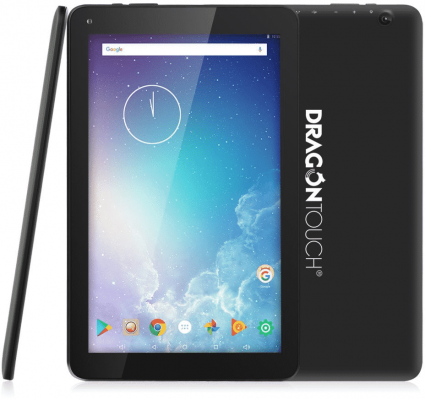 The Dragon Touch X10 comes with all the standard features on a budget tablet as well as a large 10.1-inch display and some extra ports that aren’t provided by most tablets in this price range. Sporting a smooth plastic back, it has an average looking design that easily catches fingerprints. It is thin, comfortable to hold and features a rectangular shape with slightly curved edges. The large screen has a sharp resolution of 1366 x 768 pixels and a wide 178-degree viewing angle. The primary hardware on this tablet includes a 1.8 GHz Octa-Core processor with PowerVR SGX544 GPU, 16GB of storage and 1GB of RAM. The device delivers fluid performance while launching apps and running 3D games, but the memory is still inadequate for extensive multitasking. The CPU consumes low power, allowing the tablet to run all-day on a charge, which is quite long considering the size of this tablet. While it comes with the latest Android 5.1 Lollipop OS, there is no guarantee that the users will receive further updates to Android 6.0 Marshmallow. However, it should be noted that most of its competitors still ship with the older Android 4.4 Kit Kat OS. The tablet comes with an OTG-enabled micro-USB as well as a full sized USB 2.0 port and a mini HDMI port for outputting visuals to a larger display. One odd feature, though not a deal breaker, is that this tablet bundles a 5v AC charging port instead of the usual micro-USB interface. While it’s not a high-end tablet, the Dragon Touch X10 featuring a fast octa-core processor, a sharp 10-inch IPS panel and bonus port options, and offers excellent value for the price. 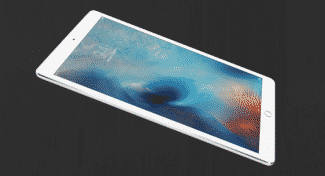 Quad Core CPU and 1GB of RAM, you will be getting a rather average tablet in terms of performance, and multitasking will be quite a hassle due to the limited RAM, but some corners had to be cut in order to provide such an inexpensive tablet. However, video streaming and basic web browsing should be effortless. It comes with a 1280×800 IPS display, which most users found to be decent, but it is not Full-HD. The battery life is rather average, ranging from 4-6 hours depending on your use, and the charging times are even slower, with the product description noting that it takes 6-8 hours to reach a full charge. It comes with an integrated GPS sensor, thereby making navigation possible even in offline mode, and it supports 2.4 GHz Wi-Fi and Bluetooth 4.0. It has 16GB of storage, which is fairly limiting, but one can increase it to 32GB with the a MicroSD card. It has includes a 2MP camera on both the front and back of the device and it is fairly well built and lightweight according to reviewers. 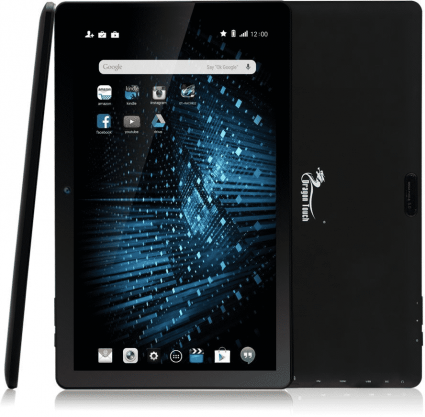 If you are looking for a simple, inexpensive tablet for basic uses such as movie streaming or simple web browsing, then the Dragon Touch V10 10.1-inch tablet should not be overlooked. For the price, the Dragon Touch V10-inch budget tablet drives an okay performance for the price, but its battery life and charging times could be deal breakers for some. The Samsung Galaxy Tab E Lite Kids is a kids’ version of the Galaxy Tablet of the same name. It comes in an attractive lime-green bumper case that protects the tablet from bumps, drops or when your three year old decides to use it as a fly swatter. Samsung pre-loaded a starter pack with popular kids apps valued at $75 and a complimentary three-month trial subscription to Samsung Kids allows unlimited app downloads with no in-app purchases. Parental controls enable you to monitor app usage and set time limits for apps, Samsung Kids also requires a password to return to normal tablet mode once set, hence protecting your child from harmful content. Some users complained of the lack of a child-friendly browser; parents must download one themselves from Google Play Store. Battery life comes in at around 8 hours which is good as it encourages prolonged child-distraction, time in which they are not disturbing you or taking over your own devices. 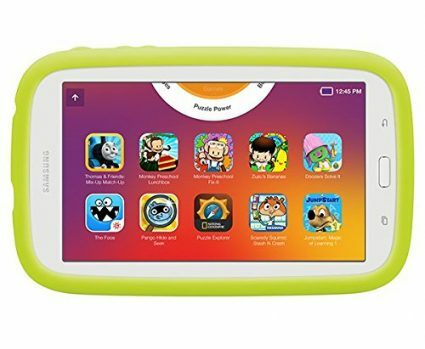 The Samsung Galaxy Tab E Lite is clearly a kids’ tablet, and the rugged child-proof design and large amount of preloaded kids’ apps and games make it excel as such. 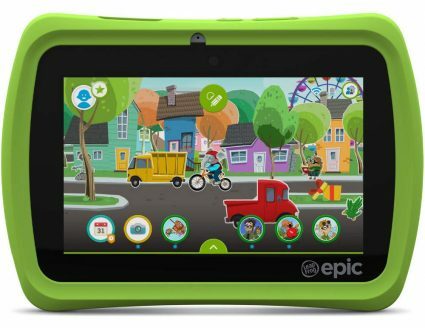 LeapFrog, one of the bestselling manufacturer of kid’s tablets, now brings you LeapFrog Epic, the latest Kid’s tablet featuring upgraded hardware and software for a slightly higher launch price than the earlier models. It is more expensive than competitors like Fire HD and Dragon Touch Y88X Kids Edition, but features more powerful internal hardware. The previous generation of LeapFrog tablets had very limited number of apps installed and some models even required game cartridges. Running Android KitKat 4.4 on a customized skin, the Epic has over 20 Leapfrog exclusive games and apps pre-installed, and it’s even possible to sideload any Android app via Amazon App Store. This means the Epic offers better flexibility in software than previous models. The Epic feels well-made but the thick screen bezels gives it an outdated look that isn’t sleek. The tablet comes with additional accessories like a silicone bumper for protection and a stylus for the kids to doodle. For a relatively expensive children’s tablet, it is a little disappointing to see that the Epic features a low quality TN display instead of an IPS panel like that on the cheaper Fire HD 7. The low resolution of 1024×600 is also not what one would expect at this price, but kids will probably not mind. One aspect where LeapFrog Epic excels at is in the hardware performance. Most kids tablets pack less than standard specs, but this tablet has a snappy 1.3 GHz Quad-Core processor, 1GB of RAM and 16GB of storage with a microSD slot for expansion. This delivers a satisfying performance even when running slightly heavier tasks. The battery life of 6 hours isn’t bad and the speakers are quite good as well. If you know your kids can compromise on the average hardware and low resolution, the LeapFrog Epic is a well-priced device that offers engaging software thoughtfully tailored for children. The Fire Kids 7 is a budget tablet with kids-oriented software & design features. It has the same hardware components and design as the current bestseller, the Fire 7, but costs a bit more for the additional parental control features, kid friendly user interface and a child-proof casing. The tablet feels firm and lightweight even with the case on and it fits comfortably in the hands of the kids without adding much extra weight. This tablet comes with a 7-inch display with 1024 x 600 pixel resolution, which is quite low but because it’s an IPS panel, it has better image quality than the TN panels on most low-price tablets. The hardware components consist of a 1.3GHz Quad Core Processor coupled with 1GB of RAM. Out of the 8GB of onboard storage only 5 is free, so for media consumption users getting a microSD is a must. If you don’t want a “kids” tablet, there are similarly priced tablets with a better display, larger storage and a faster CPU. However, compared to other Kids tablet, the Fire Kids Edition is one of the best devices available. The battery life lasts close to the advertised 7 hours, which is adequate, and the sound from the mono speaker is also sufficiently clear. 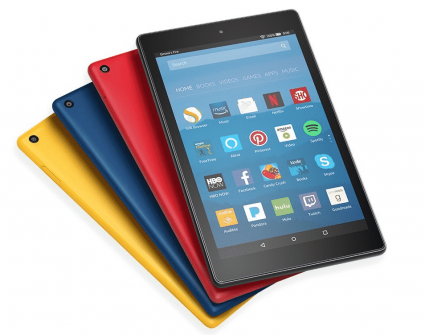 The Fire 7 tablets are based on the Amazon ecosystem, meaning instead of the Google Play Store users get access to the Amazon App Store. The Fire Kids Edition has some extra software features compared to other standard Fire Tablets. It has Amazon FreeTime camera and photo software that lets kids get creative with editing tools for adding sticks and drawing on their photos. Amazon’s parental control features allow parents to create accounts for their kids and then restrict access to certain types of content. The software bundle also includes a 1-year subscription of Kindle Freetime Unlimited that gives unlimited access to thousands of kids-oriented books, videos, learning apps and games. All in all, if you are afraid to give your kids your iPad, the affordable Fire Kids 7 is a fun-filled tablet that is designed to last and gives you full control of your child’s contents. 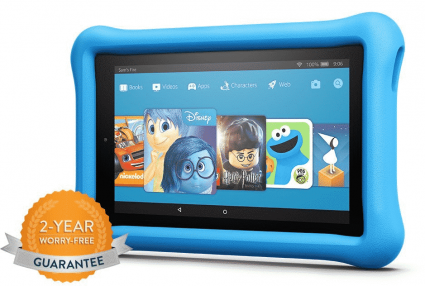 The Amazon Fire Kids Edition offers good parental controls and quality content that will please both you and your kids. It is not the fastest device nor does the battery offer the best endurance, but with a price tag that reads below $100, you are guaranteed great value for your money. The LeapFrog LeapPad3 is a feature rich learning tablet with a shatter-safe screen and an attractive soft bumper to withstand rugged use by kids. Compared to the original which had a single core 550MHz processor, the LeapPad3 offers almost twice the performance thanks to a faster 1GHz Quad-Core processor. Other improvements include a new battery indicator, 480p video recording and placement of the stylus more securely on the back rather than on the side like on the previous model. Unlike the original which used rechargeable AA batteries, the LeapPad 3 features a built-in lithium ion rechargeable battery that lasts over 6.5 hours on a charge, The display quality of the 5-inch screen has remained unchanged and sports the same 480×272 pixels resolution, but the sensitivity seems to have been improved so that touch responses are more accurate. The LeapPad 3 comes with more educational apps and games to keep the children busy and even has Wi-Fi so that kids can share apps and play cooperative games with kids with another LeapPad 3. It gives full control to parents with tools that let you create security codes, manage Kids profiles and control App Center access. The device also supports all the apps and cartridges purchased for the LeapPad 2. It may not have the latest specs or the slickest apps like an iPad but it’s actually much better built for kids. 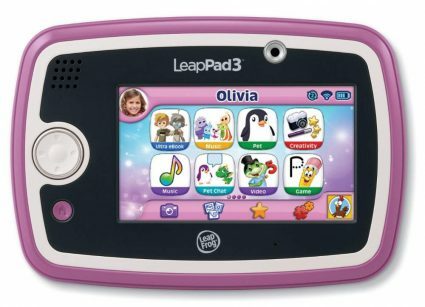 With an affordable price and robust build compared to most adult tablets, the LeapPad3 is a hit among younger kids. While the LeapPad 3 may lack the power and attractiveness of an expensive iPad, it has the necessary features to help a 3-9 year old learn and stay entertained, and parents need not empty their wallets in the process. Kids love tablets. Everybody knows that. However, just because they love them doesn’t mean you need to run out and buy them an unsecured Android tablet or even an iPad. You want to safely introduce your child to the world of tablets with something that you can control. 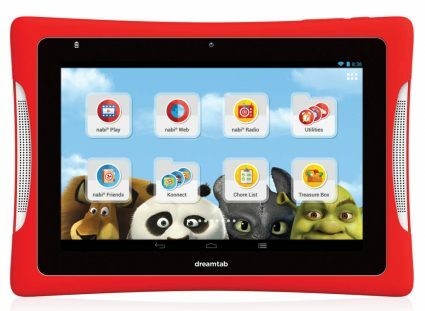 The nabi DreamTab HD8 is one of the best choices available for kids. It comes preloaded with many different apps that your child will love and it is compatible with the Google Play Store so you can expand your child’s library of apps easily. However, many of the apps require a credit card in order to use and any app you load from Google Play won’t have the same security as the apps that come with the tablet. The screen is bright and clear with impressive resolution of 1920 x 1200 for this price range and the tablet is sturdy but light making it perfect for your young child to carry around the house. Overall, the nabi DreamTab HD8 is a great choice if you are looking for a tablet with decent specs but with protection designed for kids so you can be sure they are safe while they are using their tablet. The DreamTab HD8 is a good upgrade, if you want a bigger display and more powerful hardware than your kid’s current tablet. 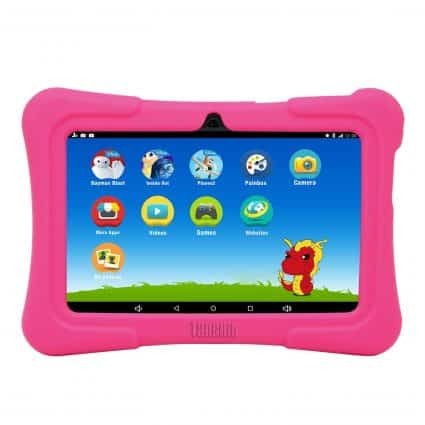 Identical to the original Y88X, the Y88X Kids Edition is a budget friendly kids tablet featuring pre-installed apps for kids and comprehensive parental control features that allow you to monitor your kids’ activities and restrict any type of usage such as web browsing, downloads and app access. The tablet also has the Zoodles Kid mode installed that features various educational apps, games, books, videos and other contents for kids all for free. The content adapts to the kid’s age and skill level, and the learning experience can be customized by the parents themselves. The tablet has a plastic build protected by a childproof case made of high quality silicone material that is durable, lightweight and environment-friendly. Besides the controlled “kids mode”, running on Android KitKat 4.4 the tablet gives full access to thousands of apps in the Google Play Store. The design is sturdy enough to survive minor bumps and falls which the tablet is likely to endure at the hands of kids. The 7-inch LCD display with 1024 x 600 pixel resolution is not the sharpest but looks good when viewed from a straight angle. Under the hood is a low-end 1.2GHZ Quad Core processor that does a good job of running day to day apps and basic games. If you plan on installing multiple social media apps or extensively browsing the internet using third party apps like Chrome browser, paying a little extra for 1GB of RAM on the Fire 7 Kids edition is worth it. However, for exclusive apps for children, the default 512MB of memory is more than adequate. The built-in 8GB of storage will run out fast if you install many apps or save large media files. Fortunately there is microSD slot for expansion. Overall, as a budget tablet the Y88X does offer good value for money, but as an exclusive kids-tablet the Fire HD 7 Kids Edition is a better option. The Dragon Touch Y88X, with its many features for kids and its child-friendly interface, make it a great inexpensive tablet for kids. The sub-$100 tablet market is full of gimmicks and cheap imitations from relatively unknown manufacturers. Furthermore, user reviews on sites such as Amazon.com can be rigged when dealing with less than reputable Chinese manufacturers. 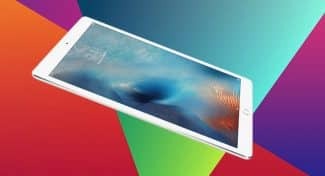 If you’re serious about getting a quality tablet that will last you may want to save up a few extra bucks and head over to our guide to tablets under $200 or checkout our guides to the best 7 inch tablets, the best 8 inch tablets and the best 10 inch tablets. The list above was put together carefully based on the tablets that appear most trustworthy, but when it comes to sub-$100 tablets be extra careful when buying from an unknown brand!